Sun., May 7, 2017, 3:30 p.m.
Like what you heard at the symphony, or want to know what you missed? Classical music critic Larry Lapidus offers his list of recommended recordings of the works featured on this past weekend’s Spokane Symphony program. The Spokane Symphony, reviewed Saturday at the Martin Woldson Theater at the Fox. For information, visit www.spokanesymphony.org. As the finale of the 2016-17 season of the Spokane Symphony, music director Eckart Preu no doubt wished to make a lasting impression on his audience, and to leave them eager to hear more in the seasons to come. He succeeded. The season concluded with a triumphant performance of one of the most gripping and powerful masterpieces in the repertoire: the Requiem (1873) of Giuseppe Verdi. In an unpredictable but brilliant feat of programming, it was preceded by the “Serenade to Music” (1938) of English composer Ralph Vaughan Williams. 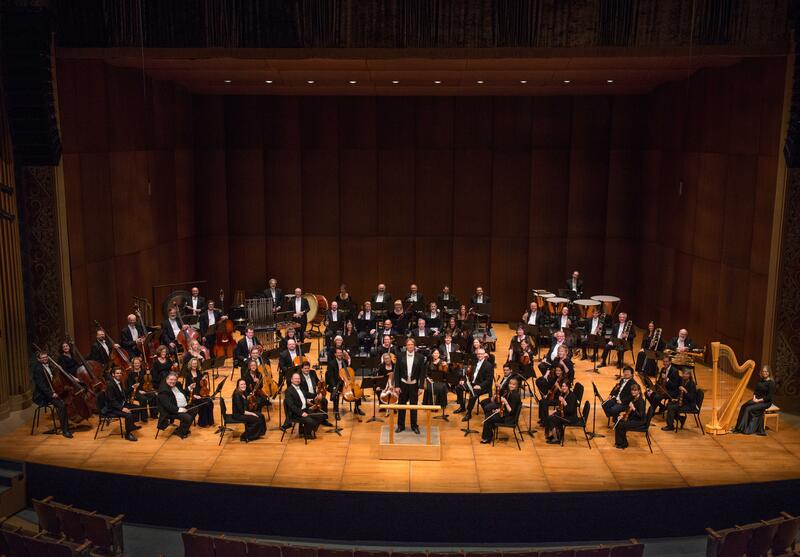 It proved brilliant, however, because it highlighted the partnership of the Spokane Symphony and the Symphony Chorale, which was joined on this occasion by the Gonzaga University Chamber Chorus and the Eastern Washington University Choir. The concerts, then, became a celebration not only of a successful season, but of the powerful current of musical life that runs through our community, bringing together people and institutions, breaking down barriers. In the Serenade to Music, Vaughan Williams distills the music from Shakespeare’s incomparable poetry, and pours it out in a 15-minute flood of enchanting melody. The text was projected as supertitles above the stage, but this was hardly necessary, so beautifully clear was the diction of the choir, under the leadership of its music director, Kristine Ploeger, and of Timothy Westerhaus, conductor of the Gonzaga Chamber Chorus. Especially remarkable was the lightness and transparency of its singing throughout the concert. Even in the most strenuous pages of the Verdi Requiem, one never sensed that voices were being pushed or forced. Preu asks for this same quality from the orchestra, and Ploeger matched it in the chorus to an exceptional degree. One must also note this refinement of tone in the playing of the orchestra’s concertmaster, Mateusz Wolski, whose playing of the violin obbligato was a highlight of the Serenade. He achieved a tone of silvery purity throughout the piece, quite in keeping with its character, but quite unlike the smoldering, earthy qualities he brought in January to the solo part in the Prokofiev Violin Concerto No. 2. Regular attendees at these concerts also may have noted the same changes in Preu’s direction that we noted in last month’s rendition of Brahms’ First Symphony: a subtle but undeniable increase in freedom and flexibility, a greater willingness to stay with a phrase, to give it more time to speak or sing. This resulted in a performance in which the “Serenade to Music” seemed to materialize from thin air, rather than to be forced upon it. In the case of the Verdi Requiem, it resulted in a nearly perfect balance between the weight given to individual phrases and the thrust required to keep Verdi’s magnificent structure in focus. Joining the chorale and the orchestra in a performance of the Requiem was an outstanding quartet of soloists: Elizabeth Caballero (soprano), Teresa Buchholz (mezzo-soprano), Adam Diegel (tenor), and Mark Walters (baritone). Both singly and in ensemble, they contributed not only superb singing that met Verdi’s heavy demands, but also the dramatic intensity that is the hallmark of this composer. Local opera lovers have had the chance recently to enjoy the gifts of Caballero and Walters, both of whom appeared in the 2015 “La Boheme” co-produced by the symphony and Opera Coeur D’Alene. While Walters scarely moved in Saturday’s performance, he nevertheless made as great a dramatic impact as Verdi’s tragic jester. He had not only the voice but the dramatic presence to fill the void created by Verdi when he silences the blaze of brass in the “Tuba mirum” and asks the baritone, accompanied only by trudging double basses and the rumble of the bass drum, to describe how “Mors stupebit….” Death itself fell silent before the eternal judge. Although hearing her in the role of Musetta gave us a chance to enjoy the beauty of Caballero’s voice, we had only glimpsed a fraction both her vocal and dramatic range until Saturday night, when she showed herself to be a Verdi soprano – one of sufficient range, power and control to mine the deep veins of tragic pathos found in all of Verdi’s heroines. Her reading of the Libera Me, capped by a stratospheric octave leap to the last syllable of “Requi….em” will live long in the memories of all who heard it. This combination of vocal virtuosity and dramatic presence was found in equal measure in the mezzo, Buchholz, who sent a high-voltage charge through a part often weighed down by monotonous piety. Each time Verdi asked for a phrase to be repeated, Buchholz found in it new shadows or new highlights, all without sacrificing the beauty and evenness of her tone. We hope for a chance to hear more of this singer. The most famous solo part in Verdi’s Requiem is the “Ingemisco,” assigned to the tenor, and, in years past, often excerpted and performed in programs that also included “La donna e mobile.” Here, and throughout the work, Diegel’s rather inexpressive countenance and gestures were more than compensated for by the strength and purity of his singing, as, seemingly without effort, he produced a flood of golden tone. A recording of this concert will be broadcast at 7 p.m. Monday on Spokane Public Radio, 91.1 FM. Published: May 7, 2017, 3:30 p.m.